A painting utility, released alongside the Nintendo 64DD, and compatible with the Nintendo 64 Mouse. Create pictures with different sized brushes, stamps, cut-and-paste tools, pre-rendered backgrounds, and more. In 3D paint mode, you can alter the textures of a 3D scene, then hit play to watch a movie run with your added textures included. In multiplayer paint mode, up to four players take to the same canvas to create an image. 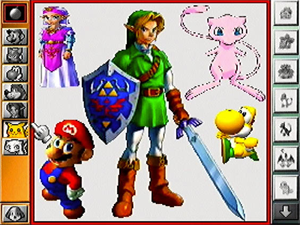 You can export the images you create in Paint Studio and import them into other 64DD games, including Mario Artist: Polygon Studio and SimCity 64.